This is a “can’t miss” event on the world’s culinary calendar, bringing together a select group of renowned national and international chefs and showing that it’s possible to blend haute cuisine, tourism and academia. The 2017 Vallarta Nayarit Gastronómica is ready for its 9th edition with the tagline “From the roots to the stars: a personal and collective journey.” Spain is the guest country bringing 11 renowned chefs, Spaniards and residents of Spain, who altogether hold 13 Michelin Stars and 21 Soles Repsol, as well as the winner of the 2014 Top España. The event, organized by Grupo E-Consulting, will take place from October 29 – November 1 in the Riviera Nayarit and Puerto Vallarta, with the full support of the Riviera Nayarit Convention and Visitors Bureau (CVB) and the Puerto Vallarta Tourism Trust (Fidetur). There will be four days of dinners and tasting and events on a nightly basis. The main host hotel is the Sheraton Buganvilias in Puerto Vallarta, where the show cooking conferences will be held along with premium tastings and gourmet workshops. There will be alternate venues including the Hard Rock Hotel Vallarta and Villa Premier, as well as Tintoque restaurant, where they will hold gala dinners on October 30th and November 1st. A particular highlight is the welcome cocktail, organized by the Riviera Nayarit Convention and Visitors Bureau, which will take place on October 29th at 8 p.m. at La Patrona Polo & Equestrian Club. Marc Murphy, director de la OVC de Riviera Nayarit; Olivier Coupat, de Sheraton Bungavilias Puerto Vallarta; Consuelo Elipe y Carlos Elizondo, directores del VNG 2017, y Miguel Andrés Hernández, director de la OCV de Puerto Vallarta. According to organizers Carlos Elizondo and Consuelo Elipe this event is “making history,” as this is the first time there will be chefs representing 13 Michelin Stars and 21 Soles Repsol together in one culinary event, positioning it not only as the best in Mexico and Latin America, but within the top ten on the world stage. “Every year we’ve directed our passion towards bringing together the most relevant figures in the culinary scene so we can celebrate four days of authentic camaraderie, pooling together all the knowledge and experience from chefs, sommeliers, and speakers in an effort to be faithful to our objective of being a seminal event for professionals, students and lovers of gastronomy,” said Elizondo. 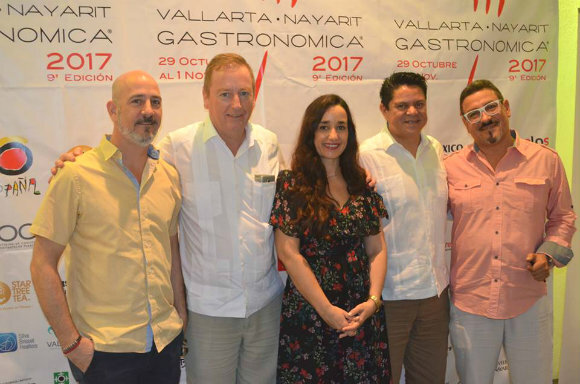 Regarding the event, Marc Murphy, Managing Director of the Riviera Nayarit Convention and Visitors Bureau, commented the destination continues to bet on culinary tourism, as gastronomy has become a fundamental asset for the promotion of the destination. 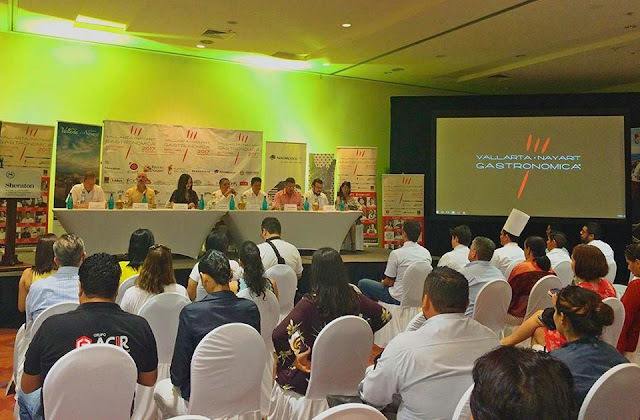 “I believe that through this type of events the destinations can project themselves onto the international stage by promoting their attributes, in this case, the excellent gastronomy available in the Riviera Nayarit and Puerto Vallarta,” he added. Of note is the fact that Spain was once again invited as the guest country and Guanajuato is on its fourth consecutive year as guest state, with Chef Ambassador David Quevedo and Traditional Cooks, Consuelo Venancio and Lourdes Camarena, on hand in representation. Jalisco and Nayarit will host the event, and for the first time the state of Morelos will also be on the program. Among the novelties for this year is a stellar panel of known figures in the tourism and culinary industries, including journalist and speaker Pedro Ferriz de Con, as well as the tourism secretaries from Jalisco and Nayarit and the directors of the offices of tourism promotion of the Riviera Nayarit and Puerto Vallarta, among others.